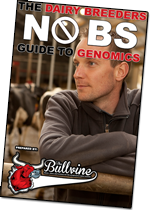 During the recent “Advancing Dairy Cattle Genetics: Genomics and Beyond”, Paul VanRaden with USDA’s Animal Improvement Programs Laboratory pointed out that “If we took the best haplotypes (genes) from all the cows genomic tested to date, we would have a cow at $7515 Net Merit”. That’s pretty spectacular considering the current top Sire on the $NM list is DE VOLMER DG SUPERSHOT at 1000 $NM. Now to put that into perspective the current rate of gain is $80 per year. So in order to breed that $7515 animal it would take us 81 years to actually breed that animal. 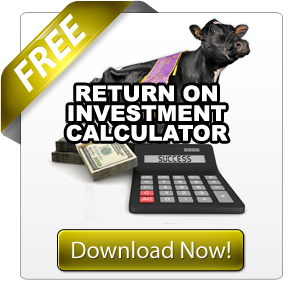 Therefore it raises the question whether such an animal is actually achievable and is there technology out there that could accelerate the process of getting that Super Cow. 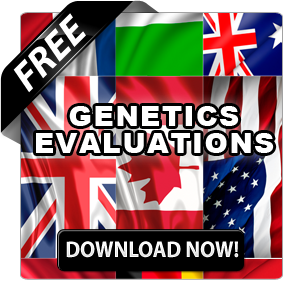 The interesting fact here is the greatly accelerated rate of genetic gain since the introduction of genomics. This results for the most part from the greatly shortened generation interval. 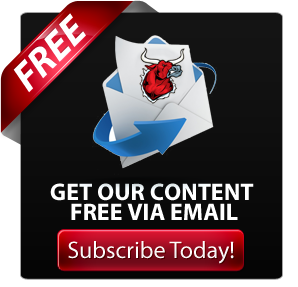 Females are now being used as bull mothers 18 months sooner than in the past (as yearlings vs mid 1st lactation), and sires of sons are now being used 24 and sometime 36 months sooner than they were in the past. 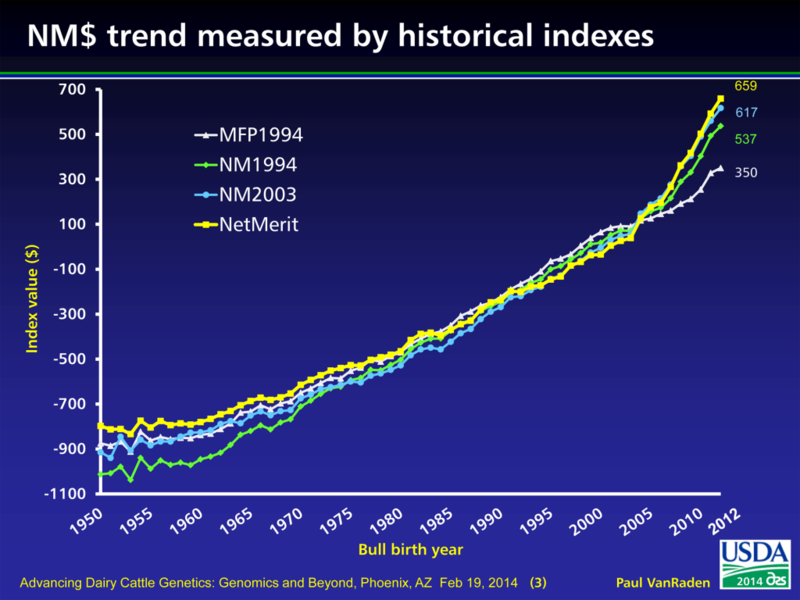 (Genomic indexes vs waiting for proven sires). The almost 40% increase in reliability of estimated transmitting ability has breeders and AI companies contracting and working with these elite animals at a significantly younger age. 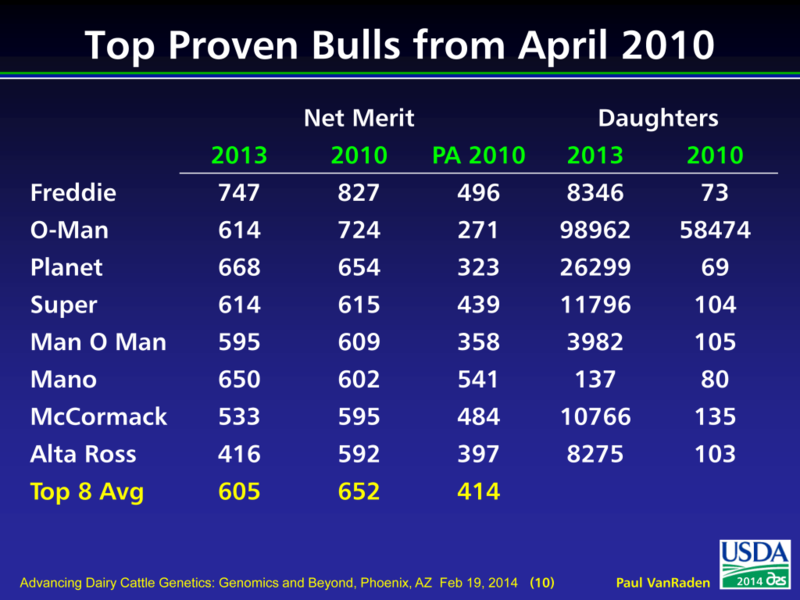 An interesting comparison is found by taking the top 8 proven sires from April 2010 and comparing them to the top 8 genomic sires from April 2010 with their current daughter proofs. 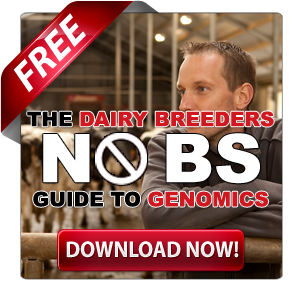 You see that the genomic sires are 99 $NM (704 vs 605) higher than the proven sires. 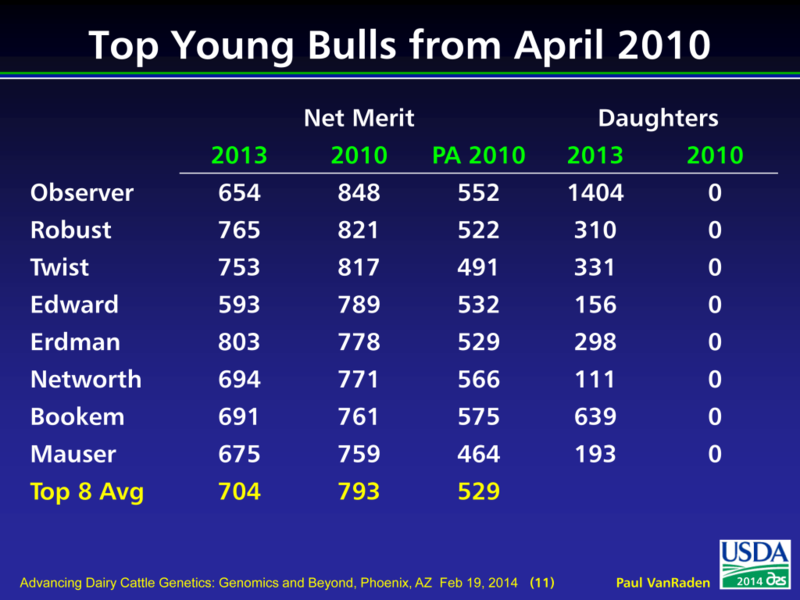 These top genomic sires, that have been heavily used as sires of sons, are 16% higher than if we had used their proven counterparts from the same time. There is no question that great breeding has always been part art and part science. However as technology grows and new discoveries seem to happen almost monthly as opposed to yearly, the balance between art and science is starting to shift drastically. I often hear many breeders comment about the failures of genetic predictions in the past. That was when reliabilities were in the 30% and 40% range. As the systems are refined and biases removed, these rates are now approaching the 70% and 80% range. Given more time, there will come a point where we have over 90% reliable information for animals on the day that they are genomically tested. Add to this the ability to genetically preselect or even manipulate the embryo and there is no question that, before long, numbers like 7515 $NM will not seem to be so astronomical. They will be the expected.